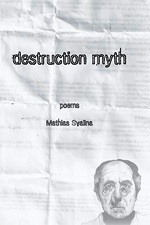 I returned to Burt’s words while reading two vibrant new poetry collections: Destruction Myth by Mathias Svalina and Sum of Every Lost Ship by Allison Titus. Both were published by Cleveland State University’s Poetry Center, which has also distinguished itself in recent years with strong books by Allison Benis White and Liz Waldner (whom Burt recognized as an Elliptical poet in a 2004 postscript to his earlier essay). Critics have not widely adopted the Elliptical descriptor. Perhaps the problem is that the term is too diffuse, lacking the geographic cohesion of a group like the Black Mountain artists or an explicit manifesto such as that binding the Objectivists. Or maybe it is just that while Burt originally focused on the work of forty- to sixty-year-old poets, the true impact of the Ellipticals is just now emerging in the work of the young writers who were reading those poets and studying with them a decade ago. Either way, Burt was onto something. The most interesting first books coming out right now, including these two titles, challenge authorial identity and embrace (as Burt suggested) “insistent, bravura forms” that prize repetition and unusual syntax constructions. Whether or not they are labeled Ellipticals, Mathias Svalina and Allison Titus write poems that flourish in the non-sequitur silences, meditative spaces, and leave-takings traditionally signified by those three trailing dots of ellipsis. In Destruction Myth, Svalina presents forty-four variations on a “Creation Myth,” all with the same title and most taking the form of prose poems, followed by one multipart, free-verse “Destruction Myth.” While our attention is firmly directed to “In the beginning” and “In the end,” the chosen verb tenses—past for creation, future for destruction—tell us that in actuality these poems are preoccupied with the middle, as experienced by a consciousness that punctuates his mythological landscapes with the iconography of his pop-culture present. And so we learn, “In the beginning everyone looked like Larry Bird / but everyone did not have the name Larry Bird / & this was confusing.” For those who believe “what belongs in a poem or what matters in life” might preclude mention of metal bands, Chris Farley, ATMs, and Kool-Aid, prepare your assumptions to be exploded. The humor of this book lies in its structure as well as its scenarios. The repetitive myth format pokes fun at our relentless and quixotic effort to explain how we came to be the way we are (which might be a particularly American obsession; after all, we’re a relatively young country). Destruction Myth often uses sentences that string together multiple comma clauses, a seemingly casual syntax belied by vibrant imagery and surreal insight. Mathias Svalina is to poetry what Mitch Hedberg was to stand-up comedy. My mother and father are both chemists. They light their ranch-style home with Bunsen burners & drink from glass beakers. They created the universe in 1968 when they dripped one foul-smelling chemical into a clear chemical that smelled like ice & formed my brother. The universe was a small apartment in South Side Chicago. My Aunt & Uncle lived downstairs inside a camera lens. Each morning my mother & father would drip chemicals from an eyedropper into a frying pan & the chemicals became French toast. When I was five they created a city that they called New Orleans. They created fire ants & water moccasins. When I was ten they created a new kind of bone that breaks. In contrast, the few poems that misfire are the ones with the least soul—creation myths that coast on clever openings (“In the beginning the registrar / took a left hook to the jaw. // He filed a complaint / with the department of left hooks”) and, once the premise is exhausted, devolve into banal violence (“He sharpened a spoon / into a shiv // & stabbed the guy / who’d given him the left hook”). That said, we should pay close attention to a collection that would risk failure rather than huddle in the shelter of conventional narrative. It’s not that Svalina doesn’t have stories to tell; it’s that he’s determined to find a new way of telling them. Though its title privileges destruction, this collection glows with the spark of something being born. If Mathias Svalina’s work sprawls, Allison Titus’s works gathers. Many of her poems are concerned with the ways we construct and compartmentalize our lives. In “Shipbuilding,” a carpenter tells a joke “that begins, The body is a series of fucked-up shutters / and already the heart, / picturing itself as a drawer / slim on its hinges and weathered, / won’t listen.” To have and to hold is an illusion, the poem suggests; love is a matter of exposure and letting one pass through. Letters are written, instructions are issued, and yet nothing stays in the haunting, haunted realm of Sum of Every Lost Ship. to the city, no wool coat. Titus also uses anaphora, long ago championed by Walt Whitman and Allen Ginsberg, and shared now with Svalina’s “Destruction Myth.” In the right hands, anaphora’s repetitions add up to a kind of syntactical argument. In the poems “Dead Letter Office” and “Patron Saint of the Deathwatch Beetle,” Titus’s stack of stand-alone lines seem to advance the case against a “you”—without the poet ever defining an “I.” It’s a neat trick, but it requires a light touch. The patterning draws attention to some overutilized symbols (flasks, clavicles, skies) that verge on becoming in-house clichés for the collection. Some of her best work emerges when Titus challenges herself by using factual material to complicate or venture beyond romantic themes. In the playful sequence “Instructions from the Narwhal,” the titular creature suggests the harvest of ice, promising “Horse-drawn plows score the frozen lakes as / your alphabet of sealskin spells farther north the / tundra.” Harkening back to Burt’s suggestion of poets claiming “the authority of the rebellious,” I would direct you to the prospect of a narwhal offering up an entire section on “How to ruin the ending.” Prose sections are effectively interspersed with free verse; “Almost all [Elliptical poets] write good prose poems,” Burt noted in his essay. The question Anderson asks herself, deep in this reverie, is “why do I remember.” Not how, but why, suggesting some part of her knows this to be a willed memory, even as she is at its mercy. It is with such subtle gestures that Titus balances empathy and skepticism. In Destruction Myth and Sum of Every Lost Ship, Mathias Svalina and Allison Titus have assembled admirable collections that challenge our conditioned presumptions in poetry. Svalina disembodies his voice; Titus disowns hers. Both use parallels in title, language, and line to help order what might otherwise be an unwieldy (if enjoyable) disorder of ideas and motifs. While the quandary of what to call this aesthetic may still be undecided, make no mistake that the more important question has been answered: yes, oh yes—these are poets you ought to be reading. 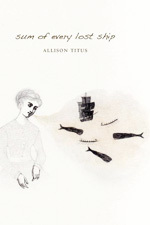 Allison Titus’ first full-length book of poems, Sum of Every Lost Ship, was published by CSU Press in 2009 and her chapbook, Instructions from the Narwhal, won the 2006 Bateau Press BOOM Chapbook Prize. She received her MFA in fiction from Virginia Commonwealth University in 2003 and her MFA in poetry from Vermont College in 2005. Titus was recently awarded a 2011 National Endowment of the Arts grant for poetry.